Improving the user experience is always our priority at ActBlue. We try to make it easier for donors to give to the causes they believe in, wherever they are. And in turn, that helps campaigns and organizations increase their conversion rate. 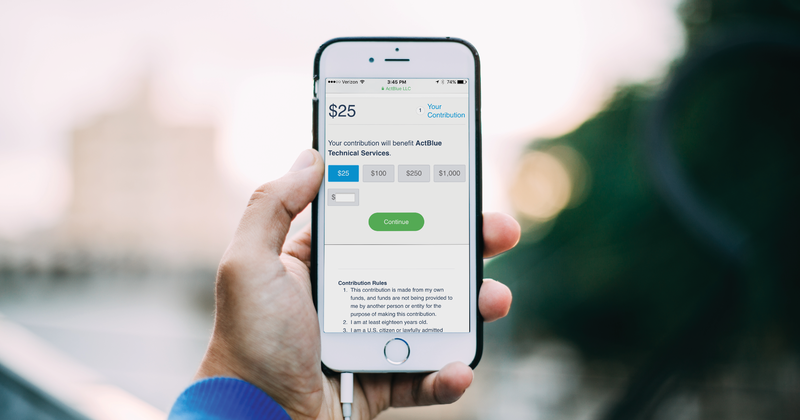 One of the biggest points of friction for donors has always been typing in their credit card number on a mobile device, and with mobile now representing 40% of our contributions, we are always trying to improve that experience. That’s why our tech team worked hard to roll out our newest feature: Apple Pay on ActBlue forms! Apple Pay has been around for a few years at physical merchants, where you might have used it to buy coffee or movie tickets. But in September, Apple updated its iOS on iPhones to be able to accept Apple Pay in browsers. We were excited to be a very early adopter of Apple Pay, and to be able to get it set up during crunch time, when it made a big difference to campaigns and committees. Apple Pay will only show up as a payment option on a contribution form when a donor has Apple Pay set up with a credit card on their device (the vast majority of the time this will be users on phones, but there are some ways to enable Apple Pay on your laptop, like with the new MacBook Pro that comes with a touch bar). We tested having the Apple Pay option available during the contribution flow and saw a 6.5% increase in conversion rates among users with Apple Pay active. After that we quietly rolled it out to every federal campaign and committee in the fall. We rushed to give access to as many people as possible before the election, and a million dollars (!!) ran through Apple Pay from the initial roll-out through Election Day. Our developers have been working to expand Apple Pay’s availability since then. Right now, Apple Pay is available for all federal campaigns, federal PACs, 527s, and c3 and c4 nonprofits. Our team is working hard to clear state and local jurisdictions one by one in the coming months, so candidates at every level of the electoral process will have access to this tool. This is just another way that ActBlue’s infrastructure is a shared resource for Democrats, progressives, and nonprofits across the country, and for the donors who want to support them. You don’t have to do anything to enable access to Apple Pay on your contribution forms, because we’ve done that automatically. In fact, your donors may have been using it for months already. We’ve already helped raise $2,532,776 from 82,904 donations through Apple Pay! You’ll notice a new pie chart on your Dashboard, which shows you what percentage of donations are coming in via Apple Pay. And when you download a .csv of your contributions, you’ll be able to see which donors are using Apple Pay, just like with PayPal. Your Apple Pay percentage might look small now, but as more folks adopt Apple Pay, we expect that to grow. And most importantly, Apple Pay will play a big role in giving donors another easy, fast way to chip in and make an impact on the critical progressive work taking place right now. If you have any questions about Apple Pay leave a comment or shoot us an email at info@actblue.com. We run optimization tests on our forms constantly, but it’s rare that we see winners as big as our recent mobile test. At this point we’re running around 40% of all donations made on mobile devices. Anything we can do to keep that number going up, the better, given the massive transition in traffic from desktop to mobile. In this test, when donors landed on a form, some were moved directly to the point on a form where they’d choose an amount to give — skipping past the contribution blurb they would normally read first, as you can see below. Others got the normal form with the headline and blurb up top. The forms that skipped over the blurb won by a landslide. The result was a statistically significant increase of 5.2% conversions on the variation (p < 0.05). It was such a big winner that we automatically rolled it out sitewide. Most of our tests see a tiny bump, but any increase in conversions makes a big difference when we’re running tens of millions of contributions through our forms each month. And a 5.2% bump? That’s real money. There were more than 250k new mobile contributions made sitewide in July, with an average contribution size of about $30. That means our mobile form test resulted in about 400k extra dollars. Like I said, real money. We previously tested a contribution form without a blurb on both desktop and mobile versions to our email list. The results were abysmal, which is why we ran this sitewide test to mobile donors specifically. By nature, our mobile users are seeking ways to save them time and enhance their convenience when they’re making contributions. And that’s what this switch gives them. We believe it’s essential that the campaigns and organizations using our tools have access to their fundraising data where and when they need it. That’s why we’re excited to announce a brand new API integration with Action Network, a fellow member of the Open Supporter Data Interface (OSDI). 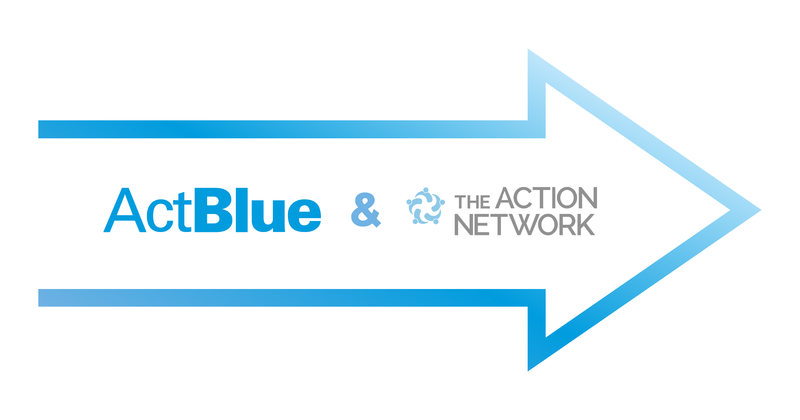 If you’re using ActBlue to fundraise, but using Action Network as your CRM, you can now send your donor and contribution info from ActBlue to Action Network automatically. The best part? It’s totally free, and it’s a quick and easy setup process. All our team needs from you is your Action Network API key to get things rolling. If you’re interested in integrating with Action Network, just drop us a line at info@actblue.com and a member of our team will be in touch. For those of you using other CRMs, we’ve already got an existing suite of integrations in place — including BSD, Salsa, and ActionKit. We also offer open webhooks, which can provide more flexibility in the way your campaign or organization retrieves data, and ultimately works with that data. Implementing webhooks will require some technical work on your end, so if your campaign or organization wants to hear more about using webhooks, you should reach out to our team and we can provide you with the details. It’s important to us that our users are able to push their data exactly where they want it, so we’re thrilled to be integrating with other platforms in the progressive space to help make that process as seamless as possible. And we’re happy to continue integrating with new platforms — if there’s a specific integration you’re interested in, you should let us know. As always, if you’ve got any questions or comments about integrations, get in touch with us at info@actblue.com. 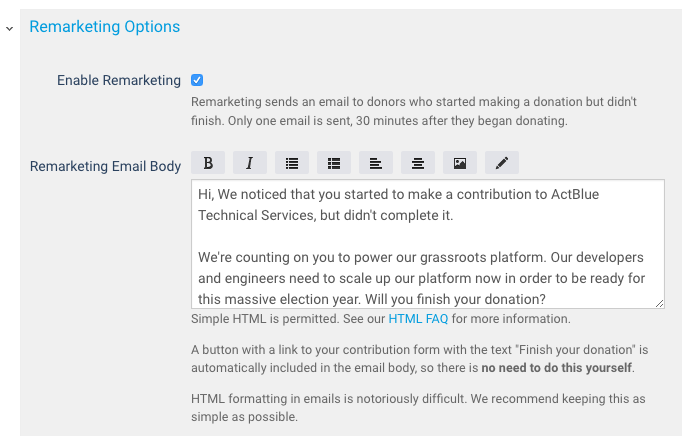 We’re rolling out a brand new remarketing feature to help you follow up with donors who started to contribute but didn’t finish. Now you can send your donors a quick, friendly email to remind them why they wanted to give and ask them to complete their contribution. If you’ve ever placed something in your cart while shopping online, clicked away, and received an email politely nudging you to finish up your purchase, you’ve gotten a remarketing email. Here’s how it works: Once you’ve turned on the feature and customized your email with your own text and branding, donors who abandon your form before completing it will automatically receive an email thirty minutes following their incomplete donation. What counts as an incomplete donation? A donor selects a contribution amount and fills in their email address, but leaves the page before going on to fill in their credit card info. In that case, we’ll make sure they get a reminder with a link to your form asking them to complete their contribution. This is available to campaigns, committees, and organizations across the board, but you must enable it on a form-by-form basis, as the feature is turned off by default. If you’d like to enable the feature just head over to the Edit tab of your contribution form. Scroll down and toggle the “Remarketing Options” drop-down menu. Check off the “Enable Remarketing” box. Next you’ll need to write up some custom text. We have an automated response (which you can see in the sample above) set up to accompany the link your donors will receive, but we highly recommend filling it out with text specific to your cause or campaign. You should view this as your chance to make the case to donors for why it’s so important that they finish the form and complete their donation. See below for an example of how to customize your text to get that message across to donors. If you have branded receipts enabled, that branding will be included on this email. The example email in this post include’s ActBlue’s branding. An unbranded email won’t include any logo. If your campaign or organization is using default forms and you would like to enable remarketing for all of those contribution forms, simply follow the steps listed above for your default form (found at the top of your list of forms within your Dashboard’s Form Management tab). In the short time since this feature was released, we’ve already seen it increase conversion rates and bring in more dollars for campaigns and organizations using it. It’s a great way to generate more funds from your asks without any extra heavy lifting. As always, if you’ve got any questions or comments about this new feature just drop us a line at info@actblue.com. I’d say last night was YUUUUGE, but others have done the Donald impression much better than I could. Suffice it to say, it was a historic night for ActBlue’s infrastructure. Yesterday evening, during a 15 minute span, ActBlue processed over 26,000 contributions. That’s equivalent to 104,000 contributions / hour. 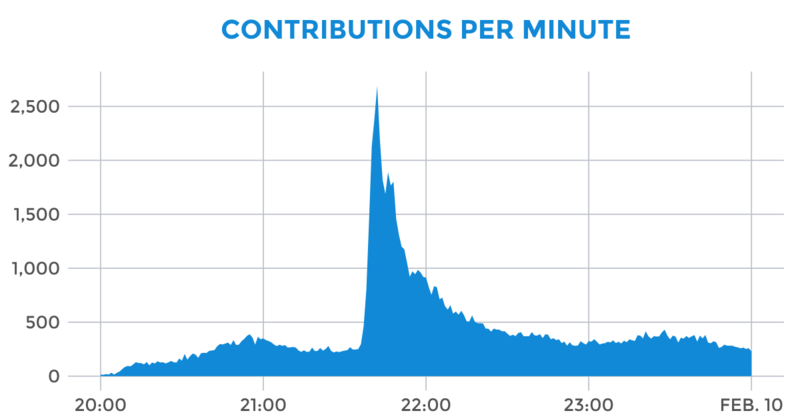 For context, the biggest hour up to last night saw 13,981 contributions created. That’s how big of a surge it was. We’re always prepping for the biggest moments, those are our bread and butter. And one of the best parts about a big night like last night is we get to see how our tools hold up to a heavy load, and how we can improve in the future. We processed every contribution that came our way last night, and we’re confident we could have handled 150k / hour (and we’ll be able to handle 200k by later tonight). It’s not ideal, and it’s not the exceptional donor experience we want to provide people with. And we were sorry for that. We worked quickly to get the issue remedied and to get the donor user flow back to what it should be. In addition to technical solutions, our customer service team was answering donor questions in real-time last night and they’re working hard to talk to every donor today. Want to guess what time Senator Sanders told a national TV audience to go to BernieSanders.com and donate $27? Those are requests / minute as recorded by our (fabulous) CDN, Fastly. And for the briefest moment in time, we hit 333,000 rpm. Prior to last night, we’d never seen that number go above 40,000 rpm. So it was, in a word, unprecedented. But the best part of the contributions per minute graph is the natural decay in rate. By that I mean the gradual downslope as the wave passed. Why is this important? Because if our infrastructure was actually in trouble the graph wouldn’t look as natural — you would be seeing some sharp drop-offs. Last night was a huge win for small-dollar donors. They once again showed that they are a powerful force to be reckoned with, and we’re committed to providing them with the best experience possible. We know that rock-solid and innovative infrastructure is key to helping Democrats up and down the ballot raise the most money online. But we also know that respecting donors and making sure they have a good experience both technology and customer service-wise is key to growing small-dollar donor participation. We’re expecting a lot more big nights, and we’re ready and excited to empower donors and help candidates build winning campaigns. If you have questions about a contribution, or want to talk shop, email us at info@actblue.com and a real person will respond, as always. The days of having one contribution form for your organization or campaign are long over. Organizations and candidates often have dozens of forms created and maintained by several different people. It can be difficult to make sure all of your settings stay consistent across your forms, especially when you have a rigorous testing program that’s frequently settling on new best practices. For example, it’s time consuming to go and change all your old forms one-by-one if testing indicates you should use different pop-up recurring language. That’s why we’re excited to roll out a new feature that allows you to create a default form with your best practices and tag pages that you want to have those universal settings. When you update the settings in the default form, all the other forms update automatically. See that contribution form at the top in grey? That’s your campaign or organization’s default form. It’s new and we’ve created it for everyone. It’ll always appear at the top of the Form Management tab. Open up the default form and select all of the settings you typically apply to every contribution form, things like your pop-up recurring ask threshold or your preset contribution amounts. It looks just like a regular form, but it only has one purpose: to establish the defaults for other forms. Once you’ve done that, go and click the “Use defaults” box for every form that ought to have those settings. That’s it! All your forms have the same settings, no matter who created them. Keep in mind that the default form will override all of the settings except for Page Name, Author, Contribution blurb, and url. That means if you leave something like the Thank you text blank on your default form, none of the forms with default settings will have Thank you text. So be careful with your selections. Further, if you’ve selected default settings for a form the only fields you’ll be able to edit are Page Name, Author, Contribution blurb, and url. Every other setting will be hidden. You can still run an A/B test or set a goal, however. And if you decide you’d like to make edits outside the default settings, just uncheck the “Use defaults” box for that form and make any edits you wish. Just keep in mind that the form won’t update the next time you edit your default form. You can always go back and edit the default form at any time. This new feature should save folks that use it a bunch of time and lead to a more consistent fundraising program. But it’s a totally optional feature, so use it at your own discretion. Our dev team has a few more new features they’re working on right now, so stay tuned! And in the meantime enjoy the new default forms. Our tech team is on a roll. Now you can enter custom content for both Facebook and Twitter shares on your contribution forms. Custom text and images should help increase conversions, so we encourage you to spend the extra couple minutes filling this in when you’re creating a new form. But at the same time, don’t expect social donations to be a magic bullet. The vast majority of contributions come in from email, with Facebook coming in far behind, followed by Twitter. Custom share content won’t change that, but it will help on the margins, especially when your campaign is in a rapid response situation. Enjoy this new feature and don’t forget to go back and edit your default donation form you link to on your website. As always, just drop us an email at info@actblue.com if you have any questions. Introducing the ActBlue Express Pass. Built for a mobile-first world. We’re always trying to improve our contribution forms — that means eliminating inefficiencies and making them more user friendly on every device. And nothing has seemed more inefficient to us than typing in 16-digit credit card numbers with your thumbs on a mobile device. That’s why we’re introducing ActBlue Express Pass, built with our 1.5 million Express user pool in mind. It lets Express users with a mobile phone number bypass the form by simply clicking a link in a text message to give. Express users are donors who have saved their payment information with ActBlue and can give in a single click. Here’s how it works: If an Express user starts filling out a contribution form on a device that doesn’t have their information stored and they have a mobile number associated with their account, we’ll offer them an Express Pass. 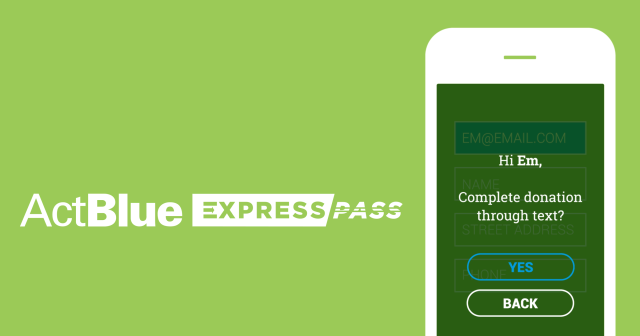 Users fill in an average of 111 characters on a form, but with Express Pass they only have to enter their email address. Why this feature? Why now? Mobile is the way of the future for online fundraising. Over the last two years, the percentage of ActBlue donations made via a mobile device has jumped from 9.1% to 29.1%. That can spike to around 67.7% on nights and weekends when people are away from their computers. We already knew that when we roll out features that improve on-the-go donations, we see astronomical gains. When we launched our mobile-responsive contribution forms back in September 2013, we saw mobile numbers jump from 9.6% to 20.5% over one month. Still, no matter how mobile-optimized your form is, it’s a pain to type in information on a mobile phone, so we decided to take that step out of the equation for Express users. It’s the next step toward our goal of making mobile donating as easy as desktop giving. Donors are already coming to campaigns and organizations via mobile, but if it’s not an easy process, some will abandon that donation. We’re meeting users where they are, and tailoring the donation process to their devices. We’ve crunched the numbers and Express Pass was associated with a 4.7% increase in conversions for mobile Express users, a statistically significant result. The benefits are two-fold: Users can donate quickly and easily with Express Pass, and the next time they donate on a mobile phone, they’ll already have their information stored right there, so they can give with just a single click. That’s going to a major investment as we get closer to the critical 2016 election. But the best thing about ActBlue Express Pass? It feels intuitive, and it fades into the background in the best possible way. It just works like it should, while bringing in more conversions for every campaign and committee. The gif above gives you an idea of how the Express Pass steps work, but we’ll break them down for you below. The user selects a donation amount, types in their email address, and moves on to fill out the rest of the form. But before they can do that, we check and see if they’re an Express user, and if they have a mobile number associated with their account (half of all Express users do). If both of those things are true, we show them a popup that reminds them they’re an Express user and offers to send them a text message where they can finish their contribution. Next, they click yes, because easy = awesome. Donors receive the text message, click the link, and their contribution goes straight through. If your campaign has chosen a post-contribution action like a pop-up recurring box or customized redirect, Express Pass users will enter that flow like any other user once their contribution processes. Otherwise, donors will see the thank you page like usual. ActBlue Express Pass will significantly improve donors’ experience when giving on-the-go, and it makes it even easier for campaigns and organizations to collect donations at in-person events. Express Pass is automatically turned on when Express Lane is enabled for a campaign or organization. Applicable donors will see Express Pass on single entity and tandem forms, but not on event and merchandise forms. Those require extra info and will still get the regular mobile treatment for the time being. With ActBlue Express Pass, we’re not just looking to scale forms that were originally built for the desktop into mobile devices. We’re coming up with a whole new way to give. That’s what the future of fundraising tech will be about — solutions that work for every device, wherever your donors are. 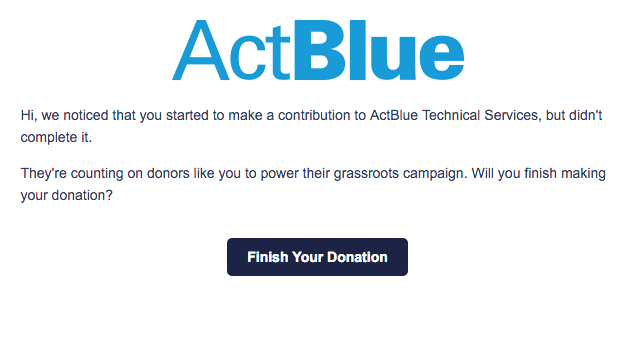 The A/B test tool on ActBlue, which allows you to test out contribution form titles and pitches, among other variables, has gotten a significant upgrade, just in time for campaign season. The old A/B testing tool worked great, but it also forced you to wait around for both test variations to get enough traffic to gain statistical significance. If one version was performing way better than the second one, that meant you were losing out on potential contributions in order to gain valuable insight. This is how most A/B testing tools work, and it’s a good system. But with the new ActBlue testing tools, which use a more advanced statistical algorithm than typical A/B testing, you can still achieve statistical significance without having to sacrifice a ton of traffic to a losing form. As the test runs and one variation begins performing better, we’ll start sending more traffic to that form, roughly in proportion to how they’re trending. 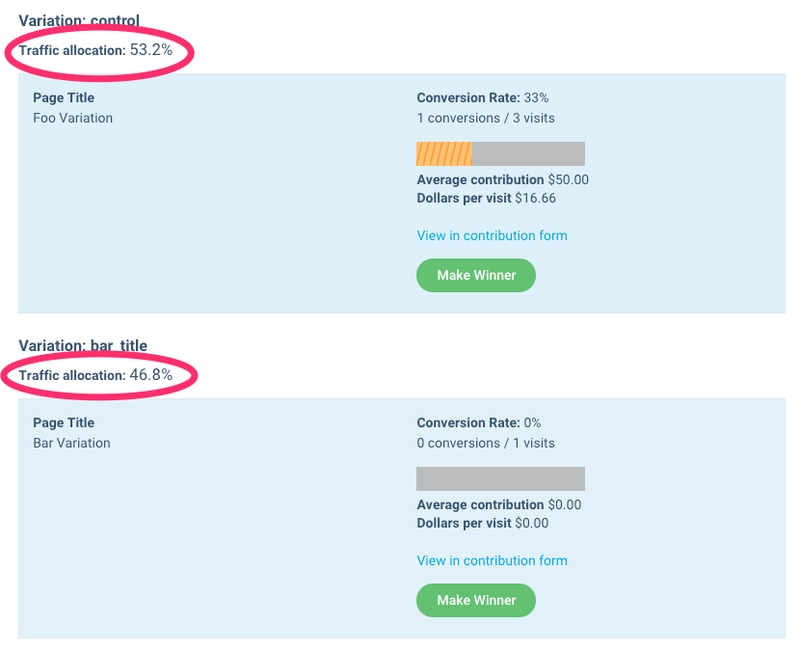 You can see the traffic allocation listed just above each variation on the “A/B Test” tab of your contribution form. The traffic allocation will change continuously as donations come in. It’s important to note that if a variation is receiving 75% of the traffic, that does not necessarily mean it’s conversion rate is 3X as high as the other variation(s). If you’re curious what it actually does mean and want to talk complicated stats, you can get in touch with us here. If there was a false positive and the losing form starts doing better, the traffic allocation will begin to reverse. The test will continue to run indefinitely until you click “Make Winner.” The A/B testing tool will eventually send 100% of volume to the winner if you don’t make either version the winner manually. The new A/B testing tool makes your tests more efficient, which means you can try out more of them. If you have radically different language you want to try on a form, alongside three more standard pitches, there’s little risk. If it doesn’t work out, we’ll send fewer and fewer people to that losing form. We wanted to give special thanks to Jim Pugh from ShareProgress for sharing notes on the multi-armed bandit method used in their software and helping us out with building this tool (and for hanging out in the ActBlue office for a week)! As always, let us know what tests you’re running and what’s working for you at info@actblue.com! Scott Brown made some uh interesting design choices for his new Massachusetts New Hampshire Senate campaign website. But where he went really wrong was his contribution form. We’re obsessive here at ActBlue about page load time, going to great lengths to shave off hundredths of a second. It’s often the difference between someone giving a donation and just simply giving up, particularly when they are on a mobile device. And that’s why 20.3% of all contributions on ActBlue last month were made on mobile. If your numbers aren’t up there, you’re doing it wrong. And none of that would have been possible without the support of thousands of ActBlue donors, so thank you. Now let’s all stop laughing at Scott Brown (for the moment) and get back to work powering Democrats to victory this November.